The dual cleaning action of this 12" microfiber mop pad is ideal for anyone with hardwood, but it also works well on any other type of hard flooring surface. It's designed for only dry use, so dust mopping or sweeping are the jobs it does best. They are meant as replacements for the StarFiber Mop set we sell, but they can also be used on any other mop that has a similar size head, and uses pads that attach via velcro strips, or something similar. The main surface area of the pad features a thick and fluffy microfiber material that almost feels like wool. It is fuzzy and plush so it is gentle on any surface, and well suited to pick up, and sweep away unwanted debris. The looped area around the outside that almost looks like yarn is a different type of microfiber. This extra material will give you more surface area to clean with, but it will also allow you to clean in and around tight spaces without actually touching anything with the mop head. This ensures a cleaner floor, and it also prevents damage to wood furniture and other delicate areas. Both materials will pick up loads of dust, dirt hair and other fine particles, and neither has any ability to scratch or harm the surface you are cleaning. As an added bonus, this powerful pad will build a charge as you work, so it will literally pull the dust in towards you in order to clean better, and make your job easier. These mop pads are totally machine washable. They can be laundered hundreds of times before they need to be replaced, and they don't even need to be washed after every mopping. After a light mopping, just rinse the pad in warm water, and then store it on the mop for later use. When it becomes completely soiled, put the pad in the washing machine for cleaning. Please Note: Never use bleach or fabric softener when washing microfiber. Bleach deteriorates the fibers and fabric softener clogs them, leading to decreased performance and a shortened life. These dry use, dusting pads are made from thicker, and higher quality material when compared to similar looking products. They also feature a design that is unique and hard to match for ability to clean. This means that they will work better and last longer, thus saving you valuable time, and reducing the usual frustration. Each one is made from a revolutionary material, comprised of wedge-shaped polyester filaments and a core of nylon. This unique fabric is what makes them clean so well. They are made of both oil-attracting and water-attracting polymers, and the extremely small fibers are woven into masses of tiny hooks & loops. The wedge-shaped edges of these millions of hooks & loops cut through dried-in stains, attracting and absorbing dirt and micro particles. They actually lift up the dirt off the floor and then store it within the fibers of the mop pad. This results in quick and easy mopping for you. Each individual fiber is one hundred times thinner than a human hair, and woven into masses, resulting in tens of thousands of strands in every square inch of fabric. They aren't treated with any chemicals, and you don't need to use any when you mop with them. The material is so good, that you only need this dry pad alone to remove 99% of all dirt, dust, and hair from your floors. The fiber's wedge shaped filaments follow surfaces, lift up dirt, and trap the particles inside the fiber. This eliminates the need for harmful sprays or dangerous chemicals, and allows you to get your floors clean faster and without anything to worry about or re-purchase afterward. Order Your Replacement Mop Pads Today! Dimensions (l x w) 14" x 8"
12" Dusting Microfiber Mop Pad - Dust mopping pads for dry use on any hard flooring. Clean without the use of chemicals. Machine washable hundreds of times. perfect for dusting our wood floors, and washes beautifully. A real bargain. A Five Pad Combination Pack. Get Prepared For Any Job! Replacement Microfiber Pad For Your Mop. Plush Chenille. Use It Wet Or Dry. 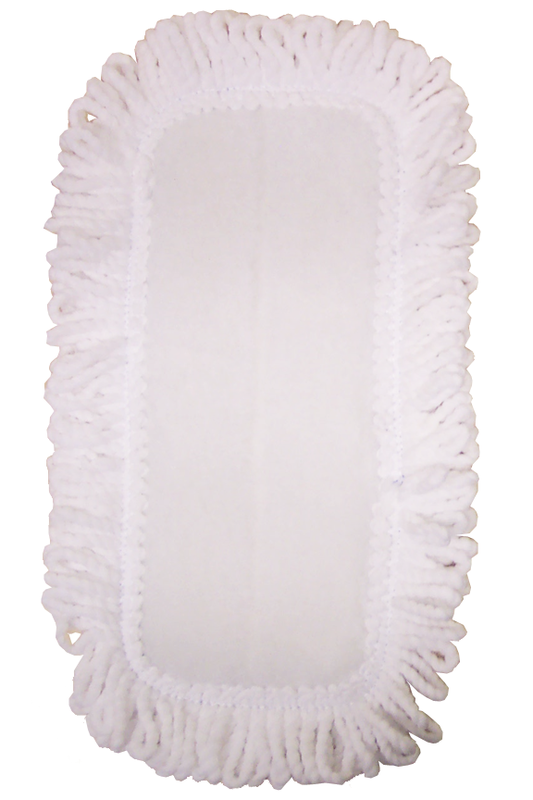 A Replacement Microfiber Pad For Wet or Dry Mopping.